On today's post, I'm going to reveal the fourth show that I believe should deserve a "last-chance" renewal by its network (or any network). As mentioned in the previous post about CBS' Unforgettable, I'm going to pick one show from each of the five U.S. networks that I think could be improved if it was saved from its cancellation. Starring (select names): Jason Isaacs, Dylan Minnette and Laura Allen. 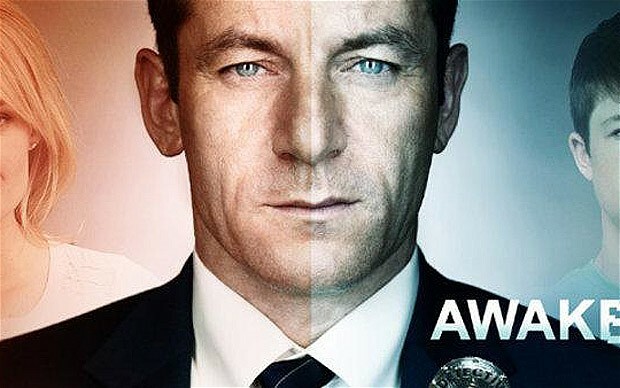 The Premise: After a devastating car crash, Detective Michael Britten (played by Jason Isaacs) returns to his life and discovers that every time he wakes up from a dream, he appears in a new alternate world where either his wife or his son has survived the same car crash. Making matters worse to the situation, depending on which reality Michael wakes up in, the other family member (wife or son) is mentioned to have died in the crash while the other survived. Reaction To Cancellation: Awake was the show this mid-season that sparked curiosity from fans and viewers. Many people wanted to discover the "truth" behind the show and determine if either the wife or the son was the true survivor. I had my own theories and watched two episodes but it didn't fully draw me in to follow the entire plot. Serial shows take dedication, especially when there is an overall arch to its storyline. Viewers who missed one episode (or even more) dropped off and couldn't follow the plot unless they backtracked. How It Could Be Saved: Awake might be a show that could have built on its initial potential. From reports I've seen about the season finale, a big twist was revealed and would have changed the entire landscape moving forward. If NBC (or any network particularly) wanted to renew the show, a fast-moving pace could help to keep viewers interested. While I don't think Awake will be picked up by another network, it's a concept that could have left fans satisfied for a few seasons to come.